This is an offering of a private room in a boutique stay, which can accommodate up to three people. The retreat is Wi-Fi-enabled and furnished for a comfortable stay. Ample parking space is provided for those with a vehicle. Your Space This holiday home features multiple seating areas furnished with comfy sofas, where you can catch with fellow travellers and share travel stories. 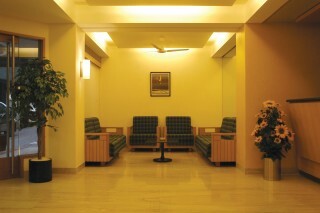 A utility hall is the perfect space to hold business meetings, if the need be. The room on offer has partially wood-panelled walls and a carpeted floor that add cheer to the space. It houses twin beds, a writing desk, coffee seating for your convenience, and a dinette to let you enjoy your meals comfortably. 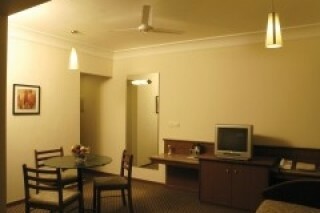 A television is also provided in this space, so you can be entertained throughout your stay. 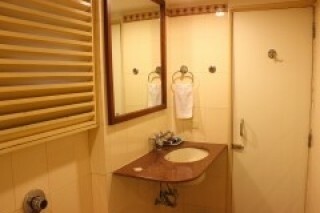 The en suite washroom is tiled and modern. Local Attractions Kankaria Lake – 3 KM Sabarmati River Front – 1 KM Plast India C.G.Road Shopping Arcade – 2 KM Sabarmati Gandhi Ashram – 4 KM Flower Show Law Garden-2KM Jama Masjid-2KM Karnival SidiSaiyyed Mosque-2KM Akshardham (Gandhinagar) – 20 KM Popular tourist places like the Gandhi Ashram and the Sabarmati River Front are both nearby. Located at Short Distances from Skylon. Law Garden is an evening market selling glittering trinkets and handicrafts of Gujarat.